Combining complimentary separates in different textures and fabrics can help you create a striking custom-made evening look that you wont find on the rack. Experimentalism is the key to creating a high-impact look, as this darkly glamorous look illustrates. Collar necklaces are an easy way to instantly transform the mood and tone of any outfit. 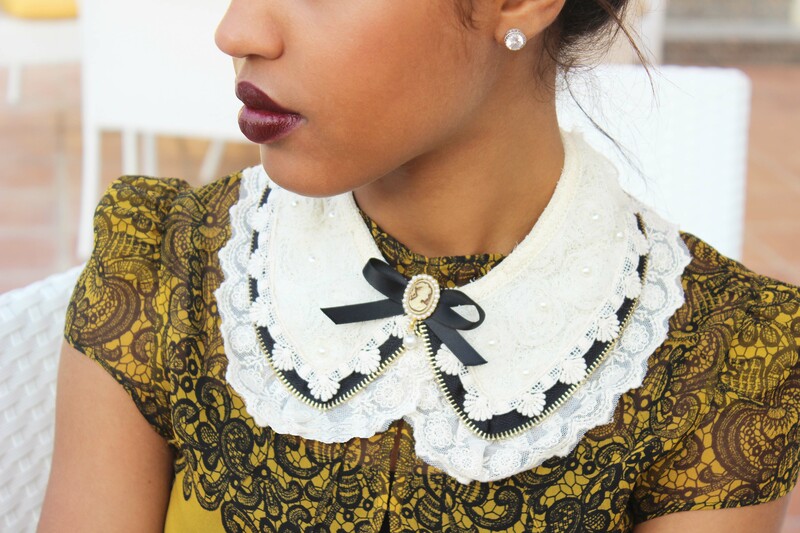 This yellow and black baroque print top is given a Victorian-esque feel and an additional element of interest and with the detachable black and white lace collar accessory. This theatrical maxi-length skirt is embellished with rhinestones and provides a goth contrast to the girlie top. The dark tulle functions as the focal point of this outfit, injecting additional drama into this ensemble. A strong look such as this calls for minimal accessories as to not overpower the theme or make it seem contrived. The small black clutch and pointy black pumps are the perfect choices to top off this girlie-goth look; their colour ties in with the look’s dark undertones, and the clutch’s velvet material keeps things texturally interesting. Additionally, the dark lipstick is a great example of how you can include your makeup look in your sartorial endeavours. 1. Lace Printed Top: Karen Millen. 2. Tulle Skirt: France Haneva (via Green Bird Boutique, Abu Dhabi, U.A.E). 3. Embellished Collar: Global Village, Dubai, U.A.E (Chinese Market). 5. Velvet Clutch: Banana Republic (Style: Anna Karenina jasmine box clutch).